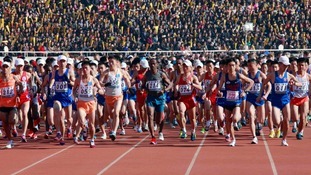 The marathon is part of celebrations to mark the anniversary of North Korea founder Kim Il Sung's birth in 1912. Endurance runner Jamie McDonald, also known as 'Adventureman', raised nearly £200,000 for children's charity during his year on the road. The favourites to win the Venice marathon finished behind a local runner - after they were led along the wrong route by a motorcycle guide. Eliud Kipchoge set an unofficial new world record at the special race but narrowly missed out on his attempt to break the two-hour barrier. A British man has died taking part in the Malta marathon, reportedly a mile from the finish line. Media reports in Malta said the Briton, believed to be 55, was accompanied by his wife during the race. The runner was allegedly given the all-clear to participate in the 26-mile competition two weeks prior by a doctor after complaining of chest pain. A Foreign and Commonwealth Office spokesman said: "Our thoughts are with the family of a British man who died in Malta on 28 February. "We stand ready to assist them at this difficult time." A British man, who has already run 7000 miles in the last eight months, is getting set to run coast to coast in the United States. Sheffield Marathon organisers have tweeted their "disappointment and regret" over the cancellation of the half marathon, due to a "problem with the delivery of water." Their website is currently down. It is with huge dissapointment & regret that we have been forced to cancel this year's race due to a problem with the delivery of water.